Have you ever found yourself in the middle of a conversation or argument and it suddenly hits you that the two of you aren’t talking about the same thing? Then you have that brilliant “aha” moment where you can actually start making some progress. One workplace conversation that can be particularly tricky is whether your company should redesign its website. It’s important to make sure everyone is talking about the same thing when you talk about redesign because it’s costly, risky, and emotionally charged. These reasons have a common denominator: you’re not happy with a very particular aspect of your site. There are many ways you can approach finding a solution to the problem, and we – the universal We – attach the word “redesign” to those solutions even though it means one of many methods are used to get the result we want. According to Dictionary.com, the above are some of the more common synonyms for “redesign”. The way Conversion Sciences uses this term is very industry-specific, so it has a certain jargon-y quality. Someone working in marketing at a tech or ecommerce company probably understands our jargon more than their colleagues in other departments. If you’re that marketing person and you’re trying to convince your boss and other departments that you need conversion optimization, it’s really important that you’re all speaking the same language. You might be experiencing some miscommunication and not even realize it. What are the different ways each of you might be using the word “redesign”? Before you dismiss it as juvenile to keep returning to basic, dictionary definitions of “redesign”, make a mental tally of important people who don’t work in marketing, conversion optimization, or graphic design. All of us feel great satisfaction in knowing the real definition, but ultimately being right isn’t helpful if no one understands each other. When we say “redesign” in its purest sense, we mean a brand spanking new website. You hired a designer, you have a new color palette and CSS, you completely threw out the old. Every page is new, the entire structure is different. When I worked at Westbank Library our website used a proprietary CMS built by the company that built our ILS (integrated library system). An ILS is used to search for books or connect to an online resource or check to see when books are due back. In other words, an ILS isn’t meant to be the platform for a very specific kind of online application. We needed a new site built on a new CMS, one that met our present-day needs. The only way to do that was to dump the old one. The new website was built using Drupal, and it meant everything was new. The change was necessary and long overdue. We were excited that on smartphones, the phone number was tel-linked and that the site was now searchable without going back to Google. Best of all, we had an actual, legitimate calendar. Before the redesign, the best we could do was make a list of what was going on. After the redesign, people could see an actual calendar with clickable events where they could go find more information. Without a doubt, the new site was an immense improvement. The lack of functionality on the old site was crippling us. In this case, a full redesign was justified, but the results weren’t what we had hoped. When the new site launched, our traffic went through the roof – hundreds of times more people were visiting our website. But since the change was long overdue, people who used the old site for a decade were totally lost. Dozens of people called us saying “I can’t find anything on this new website, you need to redesign it!” and dozens more sent us angry emails saying the same. With the amount of time we spent working on the new website, it was disheartening to hear. Small public libraries don’t have the resources to do projects like this often – and in some cases, they can’t do projects like it at all. We knew we’d been fortunate, and we were suddenly terrified we had blown our only chance to fix our site. There were very serious discussions of applying for grants, then hiring a new design team to start over. But after spending time talking to our patrons, we’d find out what they actually meant by “redesign”. In one case, a gentlemen received an email reminding him to renew his books and included a link for him to do it online. Before our redesign, that link took him to his library account where he was automatically logged in on his home computer. All he had to do was click “renew”. After the redesign, this link took him to our homepage, so he had no idea where to go. When we say that your landing pages need to fulfill the promises you’ve made in your ad, this is a great example of what we’re talking about. Instead of changing the design of anything, we needed to fix that link. Another way we knew people were lost is by analyzing how they used the site. One problem in particular was how people used our site’s search box. All of the searches were for titles of popular books and movies, but the search box wasn’t connected to the online catalog. Our old site had one search box, and its only use was to look for books and movies. Everyone assumed the new search box had the same function, but it didn’t. We used the data from our search box the same way you can use heat maps. You can accommodate how your visitors are already using your site with the data you gather. Instead of forcing them to use our search box the way we wanted, we changed it to do what they wanted. But that change meant our visitors, once again, didn’t have a site search option. From this point, we found a widget that gave us a more dynamic search bar. Then we replaced images at the bottom of the page that linked to adult, teen, and children’s programs with widgets featuring new books and the library’s Instagram account. And we featured upcoming events more prominently, moved the contact information into the footer, added navigational links along the top of the page, and worked to make the site ADA compliant. The current homepage design is very different compared to what it was when we first rolled out the new website. These changes were slow-going, careful, and made one at a time. The redesign 1.0 and current iteration look similar because of branding and tabbed browsing, but for library patrons, these are two very disparate experiences. It is safe to say the new homepage underwent another redesign, but you might hesitate to use that word because the changes didn’t happen all at once. The website wasn’t perfect, but there was a lot to work with. We couldn’t start over every time we realized the site could be doing better. We use the term “big swing” to talk about sweeping changes we make on a page. Often these changes are on a page that’s particularly important or special, like a homepage or landing page. It means we’ve changed several features all at once instead of testing one thing at a time. The downside of this strategy is that no matter how the page performs after the test goes live, we don’t really know why. If the page continues to perform with the exact same conversion rate, we don’t really know why: our changes may have offset each other. Big, sweeping changes are exciting when they are successful, and people love to share these kinds of successes. They make great headlines and engaging stories. They give us hope that our big change will work out the way we want, or perhaps even better than we imagine. The problem is that there are usually third variables at play in these stories. Think about the diet book industry. Every book boasts of its followers’ drastic life improvements due entirely to the diet. But when someone starts to pay attention to what she eats, she may also make other changes like exercising more, quitting smoking, and getting more frequent checkups with her doctor. Was her success really due to the diet book? Or was it purely chance since she made so many other changes? There’s no way to know. Humans have the potential to be rational, logical creatures, but we often fall prey to our emotions when we make decisions, dole out praise, or attach blame. 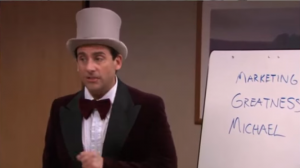 In an episode of The Office, Office Manager Michael Scott has the brilliant, big idea to send out paper shipments with five golden tickets tucked into the boxes at random. Each ticket awarded a 10% discount to its recipient. The promotion quickly goes south when Dunder Mifflin’s largest client receives all five tickets, and there are no disclaimers or expiration dates. Michael arranges for a fall guy who will be fired for the idea, but then finds out this client has decided to send Dunder Mifflin even more business because of the discount. Naturally Michael wants the credit but doesn’t want to be reprimanded for almost bankrupting the company. The Golden Ticket promotion was a big swing because Dunder Mifflin didn’t isolate the variable Michael was hoping to test: will current clients be more loyal to Dunder Mifflin because of a special, one-time-only, 10% discount? In a staff meeting last week, Conversion Scientist Megan Hoover told us, “We completely redesigned this landing page for our client, and it was a big improvement”. In a different staff meeting, fellow Conversion Scientist Chris Nolan told us, “Our first test was to redesign our client’s homepage, and it was a huge success”. Conversion Sciences doesn’t do website redesigns, we do conversion optimization. So what did Megan and Chris mean? These changes mean they were speaking accurately when they described their big swings as “redesigns”. We didn’t change the functionality of the page, the page’s purpose, or the CMS. We definitely made some big changes, but we certainly didn’t start from scratch, and all of the changes were very localized to a landing page and a homepage. 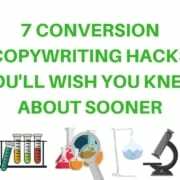 It’s worth noting that even though it’s tough to measure results when you make a big swing type of redesign, we still take the risk sometimes because Conversion Sciences has run so many successful tests. We are very good at making educated hypotheses about what kinds of changes will work well together, but we don’t attempt these big changes often. There is a lot of room for error in the big swing. What is Your Desired End Result? When you have the conversation at work about redesigning your site, try starting with the end goal. If you work backwards, the conversation has a good chance of staying on track because it’s likely that everyone wants the same thing, even if it comes out of their mouths sounding very different. I’m willing to bet that everyone wants a home page with lower bounce rates. Everyone wants to reduce cart abandonment rates. Everyone wants more downloads of your industry reports. Everyone wants to sell more merchandise. Redesigns are seductive. They come with big budgets and a chance to make a visible impact. The question at the heart of my arguments is this: do you need a website redesign, or do you need a website optimization program? With a short Conversion Strategy Session, you will be able to make the case for a full redesign or optimization program for your growing online business. Request your free session. Trina Bolfing https://conversionsciences.com/wp-content/uploads/2018/11/conversion-sciences-conversion-optimization-agency.png Trina Bolfing2016-04-28 12:38:582019-01-15 21:37:023 Very Different Meanings of the Word "Redesign"